I am now 16 weeks into my pre-contest cut and things are going amazingly well! I’m down 13 pounds so far and am just about at the weight of last contest. This cut is very different than preparing for my first contest. I thought I had plenty of time last time around but I wish I’d had more. Since I had already been dieting when I decided to compete, my metabolism wasn’t at its best. I dealt with intense hunger, lots of cardio, and quite a few frustrated tears. This time I started cutting after an extended period of eating at or even above my maintenance calories and I’ve only removed a slight amount of calories to start with. When trying to lose fat, it’s always best to cut the minimum calories you can in order to lose weight. Doing it this way gives you plenty of room to cut more if you need to keep the losses going. There have been very few days of hunger so far and quite a few days where I’ve actually had trouble stuffing all the food down! I kid you not. I also started really early this time so that I could get to where I need to be without rushing things. The other major difference is the knowledge I gained along the way on how to eat healthy but not bland bodybuilder food. I did my first contest prep towards the beginning of my healthy eating journey when I didn’t have enough knowledge or health confidence. Because of that, I hadn’t a clue how to prepare tasty meals that met my goals. I had Trainer Man tell me exactly what to eat and map out a daily meal plan. I didn’t deviate from it one bit since I didn’t want to screw it up by accident. I ate the same thing for each meal day after day. I ate flocks of plain grilled chicken breasts and broccoli. I sometimes added Mrs. Dash, mustard or soy sauce. I’m eating barbecue, stew, steak, tacos, and tons more while losing this time. In case you aren’t familiar, contest prep is different than normal dieting in that the goal is to become very lean to get on stage. Most people aren’t looking to lose quite that much fat so their eating doesn’t have to be as exact as a prep diet. I have to track my protein, fats, and carbs carefully to make sure I get enough of each but not too much. 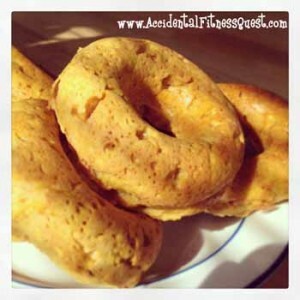 I modified my old Baked Pumpkin Donut recipe to lower the fat and sugar so that I could have a couple the other day. Yep, two donuts during prep. They turned out great and were perfect with my cup of mocha drizzle coffee. Preheat oven to 400 degrees. Mix all ingredients in a bowl and stir until well combined. The batter will be pretty thick. Spoon batter evenly into a 6 donut pan. Bake at 400 degrees for 10 minutes. Remove from oven and cool for 5 minutes. Makes 6 donuts at approximately 105 calories each – 4g protein, 18g carbs, 3g fat. Now I’m on a mission to find a recipe to use the rest of the can of pumpkin! I’m thinking a pumpkin sage cream sauce for pasta. Yummmmmm. I’m still trying to figure out how to make prep food a little more interesting. I was the same way you were for your first prep. I had very basic instructions and I never deviated from it. I did not even eat pickles because it was not the the “plan” and I never thought to ask. Silly me!